Ok I’ve been in utter denial about google reader going away, but it seems that day comes tomorrow. Hopefully if you are reading this in reader you have already imported my little internet slice to some other reader. I tried Bloglovin for a bit but found myself still going back to reader. Today it became quite clear I would need to try something else. I downloaded the app for feedly and that was up with everything imported in maybe a minute on my phone. I think it’s really a joy on the iphone. Here I am though, struggling to get it to function on the laptop. I’m thinking it doesn’t like my browser. But this is more a shout out to say "hey – keep in touch!" I added the bloglovin button a few weeks ago and just added the feedly to the sidebar (fingers crossed that button works as it wouldn’t really let me test). Of course there is always following by email too. So sad this picture is blurry. This was Averleigh this morning after being given a camera from one of the vendors at the Lachute flea market (after we spent a pretty penny). More on what we got another day when I can share some real photos. She promptly ran around taking pictures of everything and “showing” them to me. We even had to backtrack to another stall where she had met a dog, since she just had to get her picture. I’m all for encouraging her imagination. I loved the look of this little child’s pram and was so tempted to walk away with it too, but I did have to leave something behind for the other shoppers. The perspective seems really off since the furniture in the foreground is all child size too. Hope you all had just as fun a day as we did! Well here we are half way along this year long project called focus on life –yay!! If you’ve been by in the last 25 weeks then you have heard this is the work of Sally Russick of the studio sublime who manages to bring a bright spot of inspiration to my inbox each week. I’ve managed to post a picture every week so far and I’m ready for more! Then she left me high and dry – figure it out on your own. Ok, she was much nicer about it, you see this week it’s our choice of a prompt. Friday lunch time has probably been when most of my pictures for the series have been taken, I’m a last minute kind of gal. Today was non-stop rain and the outdoor subject I had planned was really not going to work. I figured I’d hold off until tomorrow, but you know it wasn’t meant to be. The first ten or so I tried to take while she was chasing a helium balloon (seriously that thing is a month old it ain’t never gonna die) and I had the cordless phone propped on my shoulder as I was shooting. Finally I said, how about you just sit on this chair for just a second we will take the picture and I won’t brush your hair. Done deal! I liked the light so I thought I’d grab a few things I have been working on for some product shots. I don’t generally try to do this with Averleigh around since I don’t really enjoy the help in this instance. Sure enough even with permission to hold and rearrange what I wasn’t shooting she couldn’t help but interject. It made me smile, her offering to hold each item saying “take the picture mama”. I often take pictures in my my hand so you can get a sense of scale, but this all goes to hell in her tiny hand. It was at that second as I saw the shot preview on the camera, I started singing. Oh Mr Jaggar, I’m sure I knew these words before I could speak them and they aren’t often called to mind but hey they all came flooding back today. Seems only right little miss found a way to wiggle into this post, I think she is featured in about half of them. Well friends, I haven’t always got to everyone’s beautiful pictures but I always enjoy your thoughtful posts and the sweet comments you leave me here. While I kid completely that Sally left us to our own devises this week I have to say I’m so glad I jumped on board as I have loved having a little kernel of inspiration to get me taking photos. The more I take the more I will learn. I can’t wait to see what you have all come up with this week right here – hope you all got what you need! Oh this one was a doozy! On Saturday when Sally sent out the prompt asking us to complete this sentence with a positive ending, it sounded simple enough. I cycled through all sorts of ideas but none really took hold, at least not in time to share. I thought of a list I saw on Pinterest, or somewhere, once about how to talk to girls. Ideas about not labelling little girls as “bossy” but “leadership potential” or some such. I recall a few gems amongst the bulk but can’t find it for the life of me to share. Seriously I needed this list to put a positive spin on some of the things that popped into my head. “You are cheap!” becomes “You are thrifty!” which is passable I think. Hubby is a wonderful, sweet and all around great guy… but he can be clumsy. He can also manage to be clumsy within a car. His story is that some “jackass” decided to cut across a parking lot just as he was pulling out of a space He swerved to avoid the collision and hit a pickup truck. He re-enacted it for me with a variety of remote controls. Well, the pickup he hit on the actual tire so there was barely a mark (yahoo!) but his bumper “exploded”. I would say a quarter of it cracked and fell off. In our household the tools and fixing of things is my domain (see clumsy reference above). He was very dubious of my suggestion that I could just glue and duct tape it back on, before I had even seen the damage. Perhaps this is what Averleigh was talking about a few weeks ago when she looked and me and declared “You are very possible mama!” I tried to figure out what she meant but to no avail. But it is one of my favourite of her one liners. ps - hubby consents to having his minor mistakes splashed across the blog. Welcome lovelies to week 24! I feel compelled to correct my omission from my typography post last week about my best friend and her distinct handwriting. She lives a few blocks away and I get to see her fairly often so that probably makes it her even more awesome that she sends mail. How could I not show her in her most awesome light! One more thing picking at my brain as I look at the title. 24. Now tell me, is it a Canadian thing to call a case of beer a “two-four”? I totally confused an American about the Victoria Day holiday by referring to it as May two-four and when I explained the name I did not hear that penny drop. at. all. This was someone in New York state too. On to Green now as promised. Sally Russick of the Studio Sublime had us seeing green this week. Living in a cold climate means that hearing green makes me think of grass and warm summer days above all else. Sunday provided just such a day! After plenty of rain we were leaving Averleigh’s last gymnastic class of the season and the beautiful day had us searching for some green space to play. We were the only ones riding behind in a covered trailer that must seat about thirty. Jim told us of the turkeys and we walked over for a visit, then the pigs, then the trains. There is a model railroad enthusiasts club that has space on the museum grounds and if you ask nicely they will take you for a ride. We had just disembarked from that “car” behind the engine he is sitting on. There are signs all over telling you to sit up straight and they ain’t kidding. Every twist and turn I was quite sure we were going to tip over, but we survived. As we explored the rest of the grounds that included all sorts of older condemned buildings that had been rescued and moved to the museum we enjoyed the green of all sorts of old trees and wide open spaces. I love the irony of this picture, my real green shot on the day. All this beautiful grass and she plays in the gravel. I’m in the winners circle for Bead Soup! 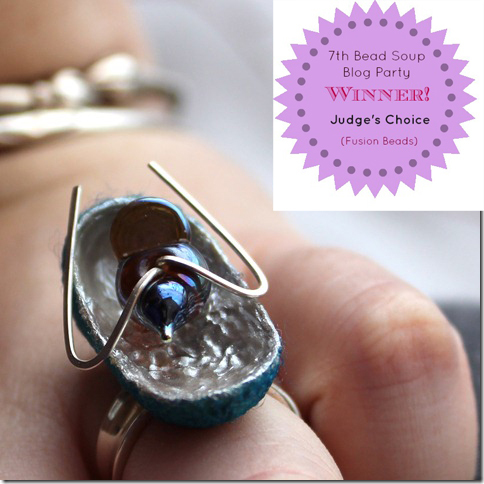 Yes my bold and one of a kind ring was found amongst the winners and runners up as part of the Bead Soup Blog Party contest. I hope if you haven’t seen all the winners yet you will take a moment with that last link, there is some serious eye candy. Now those familiar with the BSBP know it was never intended as a competition, this was just a little icing on the cake introduced this time around. That clever Lori Anderson keeps finding ways to make this swap bigger and better. I’m thrilled and humbled to have been chosen by Fusion Beads as “Judge’s Choice” especially when you hear that there are nine hundred pins of gorgeous work from the group. To celebrate I will be SHOPPING! I’m the happy recipient of a $50 gift certificate to Fusion Beads! Wouldn’t you know they even have a sale on at the moment, lucky timing. Of course I will have to look over the whole site to decide what my treat will be. I’ll be sure to share once it’s in my hot little hands. Since I’m still talking about the BSBP seems a fine time to show the earrings I never remembered to photograph to go with one of the main pieces I created. Just the other day I came across these green amethyst in my bead cabinet and it dawned on me that they were the perfect green for Cindy’s beads. A few sterling accents and some (I think) indicolite Swarovski crystals and I’ve got some very sparkly and dramatic earrings. The best part of all is I still have some more gorgeous beads to play with from my partner Cindy Ritchie. Big thanks go to Cindy, Lori and Fusion Beads for making what was already a ton of fun even better. I thought I might share a picture of a Playmobil box as some recent birthday gifts are still strewn about the place. I thought of some other pretty pervasive samples too. Then as I was walking down the stairs I caught sight of a letter I had left atop the pile usually reserved for bills. This wasn’t a bill, it was a letter addressed to Averleigh from my oldest friend (her son really I suppose). It is a chain letter of sorts, it came with stickers and instructions – I’ve bought more stickers and it’s sitting on that particular pile so I remember to mail out stickers to other waiting children. How fun to have actual mail! I wanted to share her script with you as I don’t think it has changed much over the 26 years we’ve been friends. The addressed envelope makes a pretty sorry picture though by the time I blur the address. Not to worry, I still had my own birthday card from her from a couple months ago. I thought of all the cards, the yearbooks, the random notes that I have from her and other dear friends over the years. I thought of how distinct her handwriting is to me, how very different it is from my own. I thought of how my whole family we each have very different writing from one another and leaving a note on the kitchen table you never really had to sign your name. A million scraps of paper with “Out, be back for dinner” or “Call Paulette” or so many other things always adorned some part of our kitchen growing up. I realize that hubby and I almost never leave notes for each other. We text message all those little notes back and forth all day long. I could use the distinctive screen shot of our iPhones and those colours and shapes would be a whole other powerful typography. Summer has arrived in Ottawa! Yesterday was 37C with the humidex and today is slated to be a repeat. Our winters last way too long so as you can imagine the anklet is a bit under represented locally. So when Kashmira Patel of Sadafulee…always in bloom! 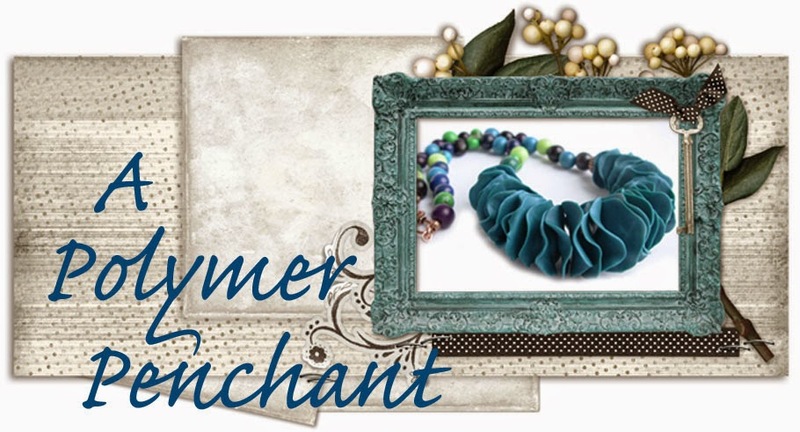 suggested an anklet blog hop I knew it would be a great creative stretch since I can’t remember if I’ve ever made one. I had the ideas floating around a while. I found my little stash of Indian bells when I signed up so I knew those would be part of the design. The rest all changed on the fly, and I only sat down to actually construct it last night. Thankfully it behaved. Textured and coloured polymer discs knotted on to brown leather with bells in font. Then the loop of silk ribbon lets this be size adjustable, and oh so comfy to sport. Since I was going for larger elements, and bumpy ones at that, I opted to just have a section so you can slide it to a safe spot when you say cross your legs sitting on the ground. I decided not to shoot a video to show off the soft little tingle that the bells make. But I did rise to the unofficial challenge of modeling the anklet. I had it tied a bit too tight so the polymer elements were standing right up but a little slack and they sit nicely across the front of the foot. I just slid it over to the side here for “ease” of photographing it (I really do have toes, just not in this pic). It’s not like me to ever remember to make a matching pair of earrings for a necklace, but for an anklet, of course! I really must go make a whole bunch of earrings as I have a craft show tomorrow and I’m getting a little freaked out about my readiness. I can’t wait to see what everyone came up with, I’m sure there will be many stunning and creative anklets to see from this bunch. Big thanks to Kashmira for hosting and inspiring us all to decorate those ankles!